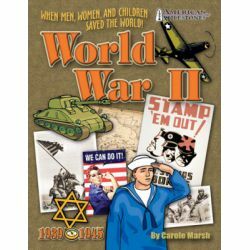 This book explores the World War that truly spanned the globe. Kids examine the history, geography, and social issues behind the greatest war in history. This book describes fascinating facts and fun activities your students will love! The American Milestone series are a favorite among teachers nationwide! This book includes ideas for lesson plans, hands-on activities, biographies, fascinating facts and stories. Your students will be amazed as they study how the Industrial Revolution impacted major changes in agriculture, manufacturing, and transportation. The American Milestone series meets national and social studies standards. This 28-page book is reproducible and educational.